This month we’ve gone a little grain mad after Abby headed to the UK Grain Lab at Small Food Bakery. Over 120 bakers, farmers, millers, plant breeders, scientists and grain enthusiasts gathered for UK Grain Lab to learn and share about the grain future we want to create, from seed to loaf… and donuts….We learn about grain populations and heritage grains, innovative projects that connect millers, bakers and farmers and we chat to bakers around the world experimenting with more diverse flours. While she was there, Abby took the Grain Pledge – created by author of the New Bread Basket, Amy Halloran – the Pledge recognises that we are all part of this grain system and that we must act together! Kimberly Bell, owner and baker at Small Food Bakery, tells us about the beauty of baking with flour from grains which allow more diversity and lower-input systems on farm. And John Reid, of RedBeard Bakery near Melbourne, shares his excitement about baking with flours milled from populations for the first time. We also spoke with Oscar Harding, farmer at Duchess Farms, and Ben MacKinnon, owner and baker at E5 Bakehouse in London, about how a conventional farm ended up working together with an organic bakery on a joint learning journey. We are also serenaded by Nathaniel Mann of Dead Rat Orchestra, who sings about – you guessed it – bread! Finally, we hear from the students at the Student Eats conference at Manchester Metropolitan University. Claire and Charmaine from Canterbury Christ Church University tell us about their project, the Gastrohub, which does experiential community events focused on reducing farm-level food waste and bringing people together. We would like to thank Rebel Kitchen for supporting this episode. Rebel Kitchen are a member of 1% for the Planet. This means they donate 1% of their sales (not just profits!) to partners contributing to the planet – it’s through this commitment they are helping to support us to continue to share knowledge in the farming community and spread the word to many more farmers and growers. This month we begin in Turin, at the international gathering of the Slow Food Movement, Terra Madre. Members of the farming and food community from over 90 different cultures around the world assemble with a shared philosophy of respect for the earth that we farm on. Among the diversity of voices in this community is Alice Walters, founder of the Chez Panisse restaurant in California and general champion of ecological agriculture. Alice shares with us just how important it is to work with small-scale farms and also gives us a sneak peak of her latest project connecting schools and small-scale farms! We also hear from a super inspiring young farmer called Muna from the West Bank in Palestine. Muna is passionate about saving the fragmented land that her family have farmed for generations. She also tells us about an epic project she began, aged just 15, tending to abandoned olive groves after recruiting young volunteers from her community. Next, we head back to the UK, to hear about an exciting farmer-led research project from Innovative Farmers. They are trialling the efficacy of different arable intercropping systems. Katie Bliss, from the Organic Research Centre and Agricology, reveals some fascinating results in favour of on-farm diversification for the suppression of weeds and reduction of chemical inputs. Finally, we revisit Jubilee Farm, to hear from Jonny Hansen, who has exciting news about a farm-share to be launched on October 20th; the first of its kind in Northern Ireland. Jonny speaks to Tiziana O’Hara of Co-operative Alternatives, who shares the benefits of the community ethic, where a network of co-operation and support achieves success. We also hear a special message from two old friends of Farmerama with some lovely news! We would like to thank Rebel Kitchen for supporting this episode. Rebel Kitchen are a member of 1% for the Planet. This means they donate 1% of their sales (not just profits!) to partners contributing to the planet – it’s through this commitment they are supporting us to continue to share knowledge in the farming community and spread the word to many more farmers and growers. Farmerama is produced by Jo Barratt, Abby Rose, and Katie Revell. Social media is led by Annie Landless with Eliza Jenkins and Olivia Oldham, and the music is by Owen Barratt. Additional reporting this week came from Jonny Hansen at Jubilee Farm. This month, we dip into the wonderful world of agroforestry: John Tucker, head of Woodland Creation at The Woodland Trust, talks us through the different types of support they offer farmers for planting and managing trees on farms. We also hear from two farmers who have already taken advantage of this help. First up are Paul and Nicole Renison, sheep farmers in Cumbria, who have about 50 new trees and lots of new hedges through the agroforestry scheme. 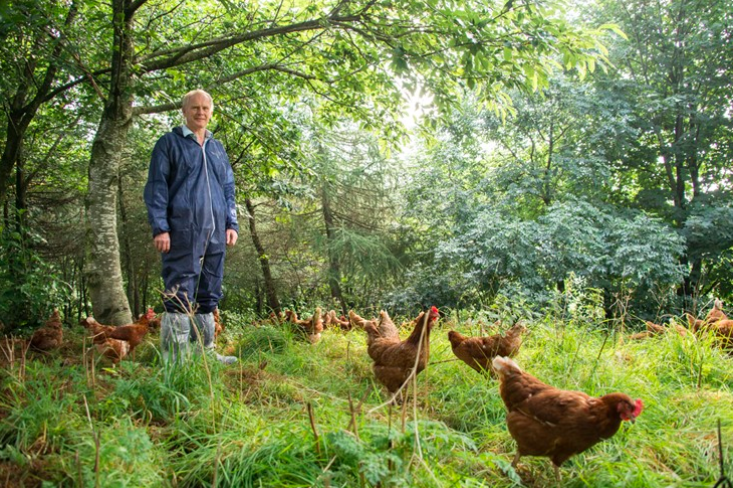 Secondly we hear from David Brass at Lakes Free Range, who planted trees almost 10 years ago on his chicken farm and says his tree investment paid back within a year. Abby reports from an event in California celebrating women’s leadership in farming. We hear from the organiser, Caiti Hachmyer of Red H Farm, about the importance of surfacing a diverse set of voices from the farming community, as well as her thoughts on land tenure in the US. Finally we have the first in a series of dispatches from a young farmer, Joel Rodker, who’s setting up a new market garden from the ground up in a sharing agreement at Whitehall Farm, Stephen and Lynne Briggs’ farm in Cambridgeshire. This episode was made by Abby Rose, Jo Barratt and Katie Revell. Thank you to Joel Rodker for contacting us and sending in his report, and thanks also to Annie Landless and everyone else who helps out behind the scenes in big and small ways – and of course to all of our guests. We’re looking forward to sharing more stories with you next month from fields and barns across the country and around the world. Katie: Hello, and welcome to another episode of Farmerama – bringing you stories, ideas and experiments from smaller-scale farms around the world. This month, we dip into the wonderful world of agroforestry. Abby has been in California, and she reports from an event celebrating women’s leadership in farming. And we have the first in a series of reports from a young farmer who’s setting up a new farm – from the ground up. Jo: Thank you, Katie, and hello to Abby, who is with me in London. Katie’s in Glasgow. Abby: Hello. To start, here are some voices from the first agroforestry conference in the UK. The conference brought together farmers and foresters: two groups who, it turns out, rarely find themselves in the same room. By mixing farming and forestry, a well-managed agroforestry system can produce as much as 40% more yield from the same plot of land than if you were growing the two crops independently. Jo: The Woodland Trust is one of the organizations leading the charge on farms in this area by helping farmers to plant new native trees on their land. John Tucker is head of Woodland Creation. John Tucker: Woodland Trust is charity. I guess we’re like the National Trust for trees. So, we’re an NGO. We have a number of aspirations, and one of them is to see more native trees and woods in the landscape. So, we were formed in 1972 and, probably for the first 35 years of our existence, we did our own thing, you know – we bought woodlands, or we bought bare land and planted trees to create new woodland. And about 10 years ago, we realized, if we really wanted to make a difference, that model just wasn’t going to work, so we had to find a way of working with existing landowners and help them make a difference for us. So, our starting point is: you’ve got to understand the objectives of that landowner. Everybody’s objectives are going to be different, and then it’s up to us to come up with, you know, what difference – how trees can make their objectives work, and it will be different for all sorts of different landowners. So we have a number of schemes depending on what people want to do. So if it’s agroforestry systems, we have financial support through AccorHotels. We can pay a certain number of euros per tree for schemes that come in. So that’s one way. We have a scheme if people want to do slightly bigger areas. If they want to plant say, half a hectare of woodland, we have a scheme called “MOREwoods” where we can cost-share through that scheme. If it’s being planted with a contractor, we can do all the design, we can organize all the plans, we can organize the contract, and then we’ll split the cost 50/50 between us. If the farmer wants to plant the trees themselves, then we cost-share: we pay 60%; the farmer pays 40%. So there are some good support mechanisms out there. There are lots of – you know, we deal in various farm tree packs as well that people can apply for online. So my suggestion would be: go to our website. There’s a, you know, they can go on there. There’s a place you can contact us for more information. Just come and talk to us. Abby: On the day, we heard from all types of farmers who’d benefited from the scheme, from potato farmers to small, mixed cow and grain farms. Jo: Nicole and Paul Renison raise sheep and cows in the Pennines. We chatted to them about their experience, and how they ended up working with the Woodland Trust. Paul Renison: Hi. I’m Paul Renison. I’m with my wife, my good lady, Nic Renison, and we farm on the East Fellside near Penrith. We’re predominantly sheep, but we do have a dairy heifer-rearing enterprise, and we’re starting a small suckler herd. The Woodland Trust have given us help with building tree boxes, which they’ve planted. They’ve built the tree boxes and they planted them up. So we’ve got about three or four different tree species in each box. We’ve probably got about 40 or 50 tree boxes around the farm, and they’ve also just recently helped with 200 metres of hedging on the entry up to the farm. Yes, our long-term plan now is to keep planting – basically keep going with it, because we’re seeing an economic advantage from doing it – and keep going ’til we run out space. Nic Renison: Well, our farm is in the Pennines and it’s bleak. There’s lots of stone walls, hardly any trees really. No hedges. And so we’ve got these sheep, and we’ve got to keep them alive, and we’ve got to produce lambs. Shelter’s a real problem. So the hedges help with the shelter, that the trees that we’ve planted in, in the kind of – to create shelter belts – that, they help keep the lambs alive. But also it’s: we’ll be there for quite a few years, and trees and hedges just make it a nicer place to be. And you don’t really want to just spend all your life living on a bleak miserable hill farm. So hopefully it will help us make money and look prettier! Paul Renison: When we first started at this farm, we were lambing indoors, and we’ve soon come to a conclusion that it’s pretty labour-intensive, and we wanted to lamb everything outdoors. So we’ve moved away from having fairly unproductive hill sheep towards a whiteface flock, but with that comes the fact that the lambs are probably slightly less hardy, so what we thought, well, we’re gonna need to make some more shelter, more windbreaks. And, luckily, Pete Leeson turned up on the scene and given us an awful lot of help with planting our trees and also his knowledge and understanding of the subject. Nic Renison: He’s quite an environmentalist and worries a lot about soil and stuff, and I… because of my background – I was kind of brought up on a farm, so it’s all very commercial – and he wanted to… So we took a fence up, and he wanted to double-fence it with three metres wide which is quite – a long amount of, a much, you know, quite a lot of field to take out, so we had quite a lot of arguments in the field with the fencing contractor. They got quite heated. I don’t think I cried, but I could well have done. And, well, my concern was that it was going to take a big chunk of perfectly productive grassland out, so I had to get over that, and watch all this perfectly good field being fenced. But soon as we started planting and it started to grow, I had to kind of eat my words, because it has been a huge benefit to the farm. It’s probably saved many lives and it’s only been up for two years. And now we’re looking at doing more and planting, you know – more kilometres around the farm as hedges. I think – lots of farmers say to us, “So how much did you get paid for planting this hedge?” – and I think, as an industry, we, we’ve got to realize that we’ve, some environmental things we just need to do off our own back, just for the good of the countryside and for future generations to come. Paul Renison: We’ve seen a benefit from doing this in terms of shelter. It just seems like a no-brainer. And if other farmers did it, they would definitely see a benefit, but it’s a, it’s a wider issue than that really. It’s, the next step is to try and get this in the hands of the government and see if we can put it into the next Common Agricultural Policy or whatever’s it’s going to be called in the future. Abby: David Brass started the Lakes Free Range Eggs Company, one of the largest producers in the UK. Jo: They source from a collective of farms, including their own, and produce 300 million eggs every year. Abby: On all of these farms, at least 20% of the farm must be planted in trees, and they have research which suggests that the trees benefit the chickens, as well as greatly reduce the amount of ammonia from chicken poo that’s put into the environment. David Brass: I’m David Brass, and I’m up in the Lake District, and we farm chickens – free-range chickens – in the Lake District. Where things, we do things a little bit differently is we plant lots of trees: instead of open fields outside for them to go out into, it’s kind of wooded area, which they’re much happier with. They come from jungle fowl. I know it’s a bit cliché, a bit naff, but that’s what they do. They like – they’re timid animals so they like if they have somewhere to hide from buzzards and things. We, it started sort of 1997 when we first started planting trees. We just saw that, on open fields, tree – chickens would, if there’s the odd tree in the field, chickens would go underneath it and stay there rather than be out in the open field. So we thought, to encourage birds to range outside, we’d plant more trees, and it worked, so we’ve just kept doing it ever since. Plant what’s there. Grows very well. It also improves the biodiversity of the area, so why not? Plant them in rows, four to five metres apart, two metres apart within the rows, because they’re easily managed for the first few years. You can just drive up and down the rows with a topper to clear the grass out rather than have to do it manually. And then look after them: keep looking after – they need more and more work. Well, not more and more work, just every year they need some maintenance to look after them. Like I said really, we plant what’s there. We do employ a guy who is consultant in tree, wood planting and technically it’s called an “upland W8 limestone woodland”, but actually it’s just what’s there. If we want to improve the biodiversity of what we’re doing and the marketability of our eggs, which are all free-range, why not improve the environment for red squirrels and bats and barn owls and things? At the same time, some people maybe plant apple trees. We don’t: we just go for the, what’s native to the area. Biggest issues? Ah, all little issues really. As you go along, you just gradually change the way you plant them, and the planting plans and some of the species that you did that don’t do particularly well. And then the biggest lesson really that we learned was to make sure you maintain them. It doesn’t take a lot of work, but it just, every year there’ll be something different that you need to do to look after your trees. They don’t just grow them… Well, they will grow themselves, but it’s a much slower process. It’s kind of interesting. Over the years, we’ve worked with a, it’s a research establishment down in Oxford, the Farm Animal Initiative, and they put some science into what we do, and so we actually do know the numbers. 16,000 bird type free-range unit, if you plant the trees, 20% of the ranging area with trees, it’ll probably cost you maybe three, three-and-a-half thousand pounds to do it, plus your own labour to actually plant them. But that’s a direct cost. You recover that back in the first year. So after that, you have three thousand pounds a year better profitability. The birds don’t die, the share of mortality is less, they’re less stressed, they don’t get the same diseases. So that gives you more, better-quality eggs, so it pays you back, yeah. It’s a no-brainer. Once you get into chickens, it’s a no-brainer, really. And, at the same time, when you walk the dog at five o’clock in the morning, it’s nice to walk through trees rather than just open, muddy fields. So, no: there’s no downsides to it at all. Katie: Caiti Hachmyer is a farmer, a food activist and the organizer of a symposium on Women’s Leadership in the Food Movement. It took place near Sebastopol, California back in September, and Abby was there. She spoke to Caiti about her roundabout route into farming, why the event is so vital, and the ways men in the food movement can support their female colleagues. Caiti Hachmyer: My name’s Caiti Hachmyer. I am the owner-operator of Red H Farm, among other things. I studied anthropology as an undergraduate at University of California, Berkeley, and I ended up in a political ecology class. It’s really where I came to understand the way the different communities around the world engage in the environment, and that the destruction to the environment that I was seeing and that was causing my kind of misanthropic tendencies was very specific to Western ways of relating to the land and to the environment. And I ended up staying at UC Berkeley for an extra semester and studying agroecology and urban farming and environmental justice, and then I spent a couple of years doing advocacy around small farmers for Food First, The Institute for Food and Development Policy and Community Alliance of Family Farmers. I came to a point where I felt like it was really important to understand farming first-hand if I was going to continue doing the work and doing the advocacy. This was about a decade ago. I also wanted to get out of the Bay Area, which is a region in California that is very progressive, and it’s very easy to espouse certain ideals to like-minded individuals. So, I moved to Minnesota – which is kind of the heart of the Midwest corn and soybean country, which is very different – and worked on a diversified vegetable farm, kind of surrounded by corn and soy there, and learned that the farmers who were part of this industrial system all around me were a lovely, wonderful people – and that it was much more complex than my 22-year-old mind had really realized. So, I’ve been working in the food movement for about a decade now, and what I’ve noticed over time is that not only do I know, factually, that women grow half the food in the world or more but, anecdotally, my own feeling – and what I discovered was shared among most of my female colleagues – is that the food movement itself is very heavily populated by women. In the nonprofit sector and academia all these different avenues, it’s women that you see everywhere. And yet the voices here in the US that really prevail are male. So the leading chefs are male, the leading journalists are male, the farmers that we hear about all the time are these, like, old, white, male farmers. And it became very frustrating and kind of enraging, and I just felt like I really wanted to create a space where we could celebrate this more quiet leadership that’s happening, because the people that are actually doing the work on the ground – again, anecdotally, to me, it feels like it’s women doing a hell of a lot of the work. And figuring out ways that their voices are not appropriated by the male executive directors of the nonprofits and things like that – it seemed really important to me. And so creating a space where everyone can come together – so it’s a conference celebrating women, but it’s certainly not only for women. The more men that come I think the more powerful that is. So that women from across the movement, whether they’re farmers working in policy and academia and advocacy, can come together and cross-pollinate and learn about the different things that are happening. This year’s theme was around storytelling and connection and collective resistance, because we’re all struggling with this very dire political situation here in the US, that I also felt like bringing that theme – kind of a more politicized theme – this year was also really important, to help strengthen people’s morale and also just the connections that can be built through that. This work is really hard. It’s been quite a challenge for me to figure out how to balance doing the work on the land – which keeps me grounded, and I think makes me feel more genuine and rooted in the work I’m doing – and also doing this more systems-level work and trying to bring voices together and be this bridge. It’s not hard emotionally. I mean, I’m exhausted, for sure! But it’s hard financially. It’s like, you know, it’s work that is not traditionally financially valued in our society. And so, figuring out how to make this all financially viable is definitely a big step and figuring out who really wants to support this work is a big step that will help with the longevity of it. From a personal standpoint, it’s, like, everything that I want to be doing. You know, I mentioned at the end of the conference today that yesterday I was thinking, “OK, this might be it.” Like, you know, “This is, it’s a lot of work, like, it’s amazing, but it’s a lot of work. I have no idea how many people are gonna come.” And then as soon as the first panel was ten minutes in, all I think is, “Oh my God. How can I not do this?! I have to keep doing this. I have to keep bringing these people together and doing this work, because it’s so, it’s so moving and inspiring and like, I feel like it’s so important for us to all come together like this, so. I think it’s time to start listening. It’s time to quiet your own voice, and it’s time to make space. I think that there’s this idea that, oh, as long as we, like, hire women in our companies and make jobs for women, that somehow that is feminism and that is creating gender equality and things like that, and I think it’s actually about more than that. It’s about taking a step back in some ways and actually opening up that space for women who are doing this work, and who are doing it more quietly, to step into a space of, not necessarily recognition, but, like, a space of being able to shine in the work that they’re doing. I don’t know if in the UK you have this concept called “mansplaining” that we have here in the US? It’s baffling the people that talk to me about the food system: the men that, at the farmers market, want to explain the food system to me, and I have to stop them and say, “I teach this at a university. I don’t need you to explain it to me.” Stop and listen. Like, know that the women around you have an amazing amount to say, an amazing amount of wisdom and knowledge, and create that space – is one is one huge piece. And then provide allyship. We all know, convening here, how much power there is in this room, and the amazing work that’s being done by women around the world. There is an issue around women trying to make that understood by men, and what women need are their male allies to make that understood to other men. We need men who are on board and who get it to be schooling the people around them – the men around them – that are still living in the Dark Ages, around what all this means and what they’re not seeing in the world. And that kind of allyship is going to be really crucial. First be quiet and listen, and then speak out to your brotherhood. Katie: Caiti also spoke about the multiple pressures of expectation placed on small-scale farmers, and why the current land tenure system makes this situation untenable. Her comments relate to the USA, but they could also apply to the UK and elsewhere. Caiti Hachmyer: So we’re in a situation here in the U.S. – I mean, I could say a lot about this issue of land justice. There is a book that was just published by Food First, the Institute for Food and Development Policy, called Land Justice: Reimagining Land, Food and the Commons in the United States, so it is U.S.-specific, but I think that the themes and the dialogue are certainly applicable across the world and particularly in a place like Britain. There’s a lot of dialogue around colonialism and race and class and things that I think are really applicable to anywhere in the Western world. I wrote a chapter that looked at the issue of land access and land security and tenure for the new farming generation. And we have this huge conundrum here that I’m sure is similar in Europe: the production value of land can never match the market value, so food production and farming, ecological farming, will never support the land that it needs to grow on. The market for ecologically-grown products is inherently in areas where the land values are the highest – all sorts of political layers to that, of course – but it makes farming really difficult, because farmers really have very insecure land tenure. So, essentially, this is the deal: we’re expecting this new generation of farmers to make high-risk, high-cost, low-return financial commitments which, in a neoliberal economy that we are stuck in, we would never expect anywhere else. And I think that what we’re doing in expecting this, like, bohemian class of farmers to just keep doing it for the love of it, and to continue this movement and kind of this new wave of back-to-the-land, I think we’re kind of building a house of cards. We’re expecting farmers to steward the land for future generations, to manage these environmental systems, to create this whole new food economy that we want to create, this cultural situation that we want – which is really what, like, these boutique farms that I am a part of are doing – and, most importantly, the biggest thing that we’re expecting globally is for small-scale farmers to essentially be on the front lines of mitigating climate change. And we’re expecting all this from people who are essentially sharecropping on wealthy people’s land. You can ask anyone who’s rented in the food system, any grower or producer that’s rented: it’s so complicated and it’s so challenging, working with landowners. And it’s no-one’s fault; it’s just about different expectations or different understandings and personalities and all those things. It’s not that anyone’s to blame, but we have this private property system here in the U.S. that means that farmers can’t actually afford the land that they need to farm on, and yet we’re expecting them to solve all of these social and environmental crises that we have. Land is like a farmer’s investment portfolio. There’s certainly financial benefits to ecological production quickly, but the real benefit is these long, deep, complex ecosystems that are built – these landscapes that are built over time, decades, generations – and if we want farmers to be farming in that way – when they could make as much money farming still organically, but, like, in a much less regenerative way – then we need to figure out ways that actually makes sense for them, and that they actually have tenure on their land. And that’s a piece of the dialogue around land justice that I can bring, and there’s certainly a much larger political dialogue around indigenous land, around Black agrarianism, around gender and land… all sorts of things. And the piece that I’ve engaged with is kind of this piece that I have a very personal connection to. Jo: OK, so thank you to Caiti and Katie. Abby, you were at the conference. What did you make of it? Jo: OK Abby, so for listeners in the UK, a rancher is, that’s like, somebody who has a lot of cows. Abby: Exactly. Someone who has a lot of cows or sheep, and they range over a large area. So there was a rancher there who’s about my age, and she was asking questions like – you know, the reason she got into ranching was after many years in the farming industry she’d really got an affinity with regenerative agriculture in terms of how she can use these wonderful animals to regenerate land on a large scale, and also she has a real affinity with animals. And she was saying, what does it look like to like manage animals in a more feminine way? Because for her, a lot of the people she’d seen managing animals did it in a very kind of aggressive, sort of taking charge of the animals. And for her – well, physically, you know, she wasn’t in a position to really be doing that. And so it’s questions like that, like what are those differences? And she put it as like, “What is a feminine land ethic?”. My main takeaway is that there are already many exciting women working in the farming world and the food world. And that we need to be more proactive about surfacing those voices. Jo: Thanks, and that’s actually something that we’re, we take quite seriously when we’re putting Farmerama together, and we are about to start publishing some data about the diversity of the people who make the show and the people who we have on air. It’s been interesting to look at the data from the last few episodes and sometimes we think we’re doing a good job, but this is really actually holding ourselves to account and saying, “Are we doing as well as we thought?”. And I think the answer is we can do a lot better. Katie: We rely on supporters to keep the show alive, so if anyone wants to support us, or know someone they think would like to, then please get in touch. We’ll send you our Supporters’ Offer with more information. Abby: Over the next few months, we’re going to be checking in with a farmer who’s taking on the job of creating a market garden from scratch. Jo: Joel Rodker is just at the start of this journey, and we’ll be along with him for the ride, learning with him and sharing experiences which I bet are oh-so-familiar to so many of you. Here’s Joel to introduce himself and set the scene. Joel Rodker: My name is Joel, and I’m setting up a market garden in Cambridgeshire, just outside Peterborough. I’m on an existing farm which is run by Stephen and Lynn Briggs, and they’re arable farmers with some fruit tree agroforestry. They’re opening up a farm shop soon, and I’m going to be growing the fresh produce for the shop, so that’s hopefully going to include vegetables, herbs and flowers. They’ve got a five-acre field which has been allocated for my use, but I’m only planning to use a small area of that. This autumn, I’m hoping to have prepared or at least covered an area of about 0.28 acres. 0.28 – so not very big, and then if things go well, I will expand next year. I’m going for 30-inch beds with 18-inch pathways. I’m going to have 60 beds to start with, and that’s gonna be divided into six blocks of 10 beds with 1.5-meter pathways between each of the six blocks. The cultivated area will only be about 0.16 acres. So, so far – I’m in the third week now, and I’m only here two or three days a week – I have dug over 360 meters squared. It’s pretty slow-going. The soil is really amazing. It’s very light; it’s very fertile. But there’s quite a lot of couch grass root in the soil, so I’m trying to get as much of that out as possible, which is heavy going. I can’t really think of an alternative to digging it out with a fork, but I am probably gonna cover some of the area with silage sheet, just so I don’t have to worry about the weeds coming back until I get around to digging it. I’m getting lots of transplants in plugs from Delfland Nurseries because I haven’t had time to sow anything myself. So I’ve got lots of brassicas, some onions, spinach, a few other lettuces and things which I am going to put in and have been putting in. Over the winter, most of that won’t need covering, shouldn’t need covering. I guess, at the moment, things that I’m a little bit concerned about are the lack of irrigation. We’re still applying for an irrigation license, so there is a sort of temporary watering system setup. But it’s not that efficient. I can use watering cans, but that takes quite a long time. But hopefully, given the time of year, it shouldn’t be too dry – although it hasn’t rained much recently. I’m thinking about how I’m gonna arrange the post-harvest infrastructure. That’s quite a big job. I’m not quite sure where that’s going to go, and how that’s going to be designed. And getting ready for sowing in spring I guess is another big challenge that I’m thinking about: what seeds I need to order; what crops I want. So there’s a lot of different things going on in my head at the moment, but I guess while I’m digging out the couch grass I’ve got a lot of time to think, so I can mull those things over in my mind, and once I’ve dug enough ground to plant the plugs that I’ve bought, then I can maybe start to look at some of the other infrastructure that needs doing. I guess the best thing so far is has just been starting, because I’ve been thinking about this for a long time, and to finally be setting everything out and doing what I’ve been thinking about for a long time is quite hard to believe, actually, so that’s a great feeling. Yesterday a friend came over and took some drone footage, and that was really nice to see – what I’ve done so far and see all the beds laid out and see that I’ve got all the straight lines right and see the rows of plants. Yeah, to see the, to see the plants in the ground and doing well – that’s a really nice feeling. So hopefully by next spring there’ll be a lot more of that. It’s very early days, but hopefully they’ll be lots more to share and I’m looking forward to learning and I’m looking forward to a productive next season. Abby: We know that we have lots of people listening who have been in a similar position, so we definitely encourage you to get in touch with Joel – maybe through us – and share what you’ve learned with him. Maybe you have a suggestion for helping him get rid of that dreaded couch grass he’s dealing with! Jo: Thank you for listening to us. If you’re new to the show, do have a look and a listen to our back catalogue on our SoundCloud page, because as well as the regular monthly shows – and we’ve got them going back now for, there’s 26 other ones – there’s some more short features available, which you won’t find on the podcast feed, so it’s worth checking out. We call these “shorts”. Abby: Toodle-oo, and thanks for listening. Jo: Yep. Thanks for listening. That’s it from us. See you next time. Katie: This episode was made by Abby, Jo and me, Katie. Thank you to Joel for contacting us and sending in his report, and thanks also to Annie and everyone else who helps out behind the scenes in big and small ways – and of course to all of our guests. We’re looking forward to sharing more stories with you next month from fields and barns across the country and around the world.